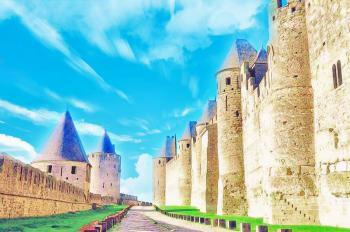 The Historic Fortified City of Carcassonne is a medieval town which structure has evolved since the Late Roman period. The site consists of 3km long fortifications, which enclose the castle, medieval town cathedral. The fortress was thoroughly restored from 1853 by the theorist and architect Eugène Viollet-le-Duc. This restoration has been strongly criticized, as it was not overly authentic (for example in the use of slates, where local practice was traditionally of tile roofing). I reached Carcassonne around midday, already pretty tired after a flight from NL to Toulouse ànd waking up at 4.30 am discovering a burglar hanging on the outside of my apartment block. I arrived at the parking lot outside Carcassonne's La Cité safely though. The welcoming sight of the Porte Narbonnaise, the entry gate, made me happy though. Some of the best views of this fortified town I had from the highway. There's also a viewpoint there, but that turned out just too far away to get great photos. The sight of the city with all those turrets and towers (45 of them) is surely one to behold. I walked between the two rows of city walls, a pleasant short hike. Unfortunately the city is somewhat of an empty shell. The fortifications are in great shape, but there's not a lot to see inside. I visited the castle, where the steep 8.5 EUR entrance fee wasn't really worth it. During the summer holidays Carcassonne reportedly is one big tourist trap, and though it was pretty quiet now it is easy to see that the souvenir shops and restaurants have taken over from real life within the walls. 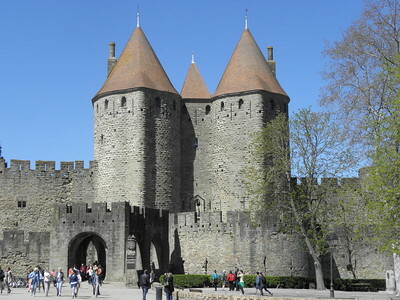 I loved Carcassonne with its massive stone walls, pointy turrets, and the inner castle of Chateau Comtal. Sure, Viollet-le-Duc may have taken some artistic license, but the overall result is really fantastic. Part of my enthusiasm for the city may be from the time of year that I visited. I visited in late October -- the weather was crisp and fine, and the crowds very small. I might feel differently if I had been fighting the summer hordes. I had an easy time getting photos with no people during the early morning or evening. I made it my base for a few nights, staying a couple blocks outside La Cite'. I had a blast exploring many Cathar Castles (and non-Cathar) in the extended area, from the 4 castles of Las Tours down to the Pyrennes, plus other sights, including the WHS Canal du Midi. One of Carcasssonne's highlights was certainly taking the ramparts walk (combined ticket with the Chateau Comtal). I also stopped in for mass in the ancient basilica in the citadel. This has some gorgeous stained glass, which was unfortunately mostly hidden behind scaffolding while I was there (2017), but I really loved the small glimpses I could get. It was great strolling into the citadel after dark for a hot dish of cassoulet at one of the outdoor restaurant tables in the chilly autumn air. In Sept 2018, while we were “in town” looking at the Canal du Midi, we paid a revisit to the Old City of Carcassonne – after a gap of many years. A mistake, unfortunately. “Never go back” is the saying but it isn’t always true in the case of WHS. Many of them certainly repay multiple revisits to deepen knowledge and add new positive memories. But, in other cases, a revisit can overlay earlier impressions with more negative ones, highlight the site’s deficiencies and the changes which have occurred both in one’s own views/knowledge and in the site itself. During the visit I found myself asking “why are we here”? Not a good sign! Across the passing years Carcassonne had become even more a pastiche of a pastiche. A pseudo mediaeval theme park. Yes - the skyline is “iconic” but then so is that of the “Cinderella Castle” at Disneyworld! It receives more than 3 million visitors each year - presumably supercharged in part by its additional "fame" as the title of the Board/Xbox game. Crossing the Pont Vieux we ran the gauntlet of assorted “mediaeval” peasants and soldiers who had erected “barriers” across it, either to persuade tourists to stop and inspect their wares or else just to have a chance to play out their hobby of dressing up as peasants and soldiers. The citadel itself was festooned with a “castle sized” contemporary “art installation” titled “Cercles concentriques excentriques” which had been created to “celebrate” 20 years of UNESCO inscription (Photo - The artwork has not been received without criticism. It would have “failed” of course if it had been otherwise!). 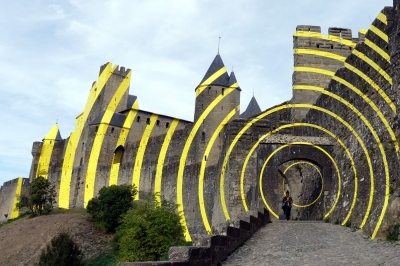 The Swiss artist Felice Varini has explained - “During the tour of the castle, people will notice these yellow circles gradually spread from Porte d’Aude. Such experience also attracts them to explore more about the heritage.” Another comment is that they challenge “visitors’ vision and perception of it. As you stroll through the castle and ramparts, you’ll see a range of different points of view created by the painted sheets and the existing structure, which will give you a new reading of the architecture and of illusionist art”. Hmmm???? I presume that both sponsors and artist had intended that such "exploration" and "new reading" would be positive towards the site on its 20th anniversary. An alternative view might be that creating an "Illusion" on its walls was entirely appropriate for a city which is itself significantly an "illusion" and, furthermore, has become famous as the title of an illusory Xbox world. On this Saturday afternoon in September (what must it be like in August?) the whole place was heaving with people. We escaped to those parts of the walls which were freely accessible - but Carcassonne looks better from the outside looking towards it rather than looking out from it onto the suburbs of the contemporary town. I would never suggest that the "Old City" doesn’t “need” to be seen “once”, but what does it offer beyond that first “wow” and the buzz of crowds and restaurants? I was interested to note that ICOMOS suggested in its original 1985 evaluation (which led to “deferral”) that it might be better nominated "as an eloquent example of the conservation policy of the 19th century and the restoration doctrines of Viollet-leDuc” rather than as an example of fortifications stretching from Roman to Mediaeval times. One of the 2 inscription criteria from 1997 states that it is “of exceptional importance by virtue of the restoration work carried out in the second half of the 19th century by Viollet-le-Duc, which had a profound influence on subsequent developments in conservation principles and practice.” - The AB notes that no criteria were proposed in the Nomination so, presumably, the inclusion of this one owes much to ICOMOS which, from the text of its evaluation, clearly had to "wrestle" over how best to handle this aspect. Another surprising fact is that "The original nomination related only to the fortifications, the castle, and the cathedral. ICOMOS is of the opinion that the entire urban complex intra muros cannot easily be separated from the fortifications." I am reminded of the US catch phrase “Where’s the beef?” The restored Citadel is too much of a candy floss confection for my taste - appealing primarily to first impressions. There are remains of the mediaeval and earlier periods in the layout and the lower strata (and in the interior of the heavily restored Basilica which we didn't visit on this occasion) but they are overwhelmed by the restoration. I note that France has added to its T list 7 nearby "Sentinel Castles" together with the Old City (and hence presumably as an "extension"). We might have been better advised to spend our time visiting one of these - reading about them on Wiki they seem to have retained much more of their genuine "13th C" aspects - and also their "wildness". Their addition could actually help increase the genuine "mediaeval" content of the whole inscription. Indeed the description for this T List entry claims just that. In the mean time Carcassonne has become the first WHS where I have actually reduced my rating following a repeat visit! When I planned to visit Carcassonne, I made sure that our group must stop at the highway rest area outside the city to see the famous view of the medieval fortifications, and when I saw it, I was really pleased that the first view of this World Heritage Site was indeed impressive and deserved its famed reputation as one of the best walled cities in the world. 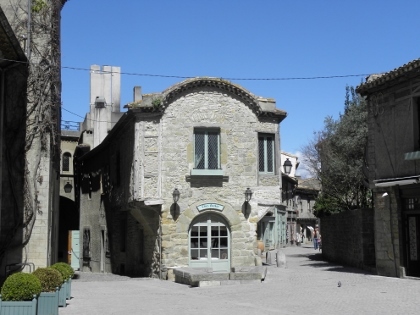 My friends and I decided to stay at Carcassonne for one night, at first we were in dilemma between stay in the old city or in the newer area, at the end we decided to book an apartment in the new city but within short distance to the old quarter. The view of city wall together with its old Pont Vieux from Pont Nerf was really amazing. From here we could see that the fortifications were actually really complex in design which different from other famous walled cities like Avila and Dubrovnik which have almost similar pattern on the whole system. Its complexity reminded me Segovia’s Alcazar, but Carcassonne was much bigger and grander. One of the thing that made Carcassonne looked even more special was its conical witch hat roofs on its many towers, again similar to Segovia’s Alcazar. While these creations of Viollet le Duc were controversial, they really made the fortifications more interesting and has visual impact more than other city walls. After we admire the outside fortifications, we walked to see inside. The pathway from the new town to the city gate of Porte d’Aude in the western side was quite steep and looked dangerously slippery after raining, but really beautiful. When we were inside the old city, we were quite surprised that the city was quite lovely than we expected. I noticed that the city must be full of tourist shops, but because we visited on low season, only few shops were still opened. Then we looked around the city to find a recommended restaurant to try the famous Cassoulet, a local dish of white bean and pork stew which was really nice for cold winter. We walked to the eastern side of fortifications, these side was quite different from the western side. While the western fortification was built on steep hill, the eastern side seem to be built on the normal level ground which required a large ditch and ramparts for better protection especially around the city gate of Porte Narbonnaise. We decided not to walk on the wall, as we believed that it is much better to see from the ground level, also Chateau Comtal which was the center of all fortifications were closed for renovation during our visit. We were in the old city until sunset and walked back to our apartment, Carcassonne at night time was also stunning especially when looking from Pont Vieux, but the spooky atmosphere around Porte d’Aude was really something. 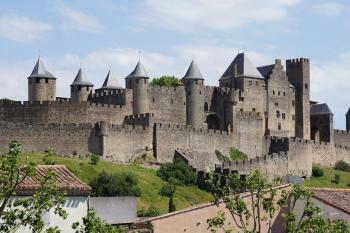 In my opinion Carcassonne was a very nice example of European medieval town and really fine World Heritage Site. Its fortification are really great in terms of size and design. While the old city itself was a bit too small than my original thought, I still really enjoyed my time in Carcassonne. Carcassonne is the classic medieval city in France, and probably even in Western Europe, and the immense crowds of visitors (as well as the popular board game of the same name) certainly attest to this. The city was apparently almost in ruins by the 19th century, and then restored to today's appearance by famous architect Viollet-le-Duc (to what people in the 19th century thought was a medieval style, so it's a bit on the tacky side). The main attractions include the fortified walls and city gates, the basilica (formerly the cathedral, with beautiful stained-glass windows), and the castle (which looked interesting, but I still decided to skip it as the reviews were not so glowing). Despite the masses of visitors and the July heat, it was a nice experience to walk through the narrow streets and admire the medieval architecture. 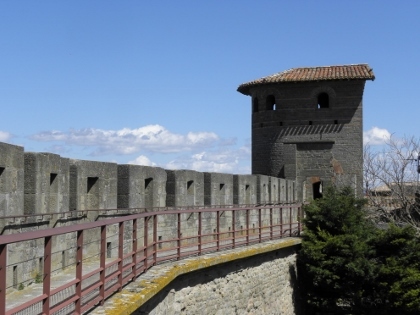 There are impressive views of the fortified city, which sits on an easily defensible hill, from several parts of the modern city, and from the fortified city, there are views over a large territory, on a clear day reaching as far as the Pyrenees. The train station (on the Toulouse-Narbonne line), which by the way sits right on the Canal du Midi, is about a 25-minute walk from the fortified city, but it's a pleasant stroll through the modern town. It poured the day we were in Carcassonne and as photographers we were up at the crack of dawn to capture an intimate and personal shoot with the medieval fortress before the throngs of tourists. As we exited our hotel we passed a tourism vehicle with Le tour de France emblazoned on its panels….and discovered that the Tour de France was going to sprint by the entry to the fortress that very day! Even though the weather was poor the timing was spot on and we photographed the race. Timing is everything…and yes, the weather improved and we loved exploring this incredible place. Even the shopping was spectacular. I brought home a French kitchen witch decked out in orange heels and holding a pumpkin…all very important to my family lore. Being there and seeing it was unbelievable. What a fantastic place! The Cité de Carcassonne is visible from a distance towering over the town and the surrounding landscape. With its massive walls and the numerous towers it is an exceptional example of a fortified medieval city. The fortifications were restored in the 19th century under the direction of Viollet-le-Duc. However his "visually optimized" restoration, e.g. the modification of the tower roofs, has been heavily criticized, and is still controversial. The Advisory Body Evaluation refers to this debate and the restoration by Viollet-Le-Duc is an essential element of the nomination. But today's visitors do not care about this debate. Anyway, when walking through the narrow streets you feel like on a trip back into the Middle Ages, even though the many tourists impair the pleasure. I was reminded of my childhood when I played jousting tournament or siege of a castle or liberation of the princess. Carcassonne would have provided the perfect setting. 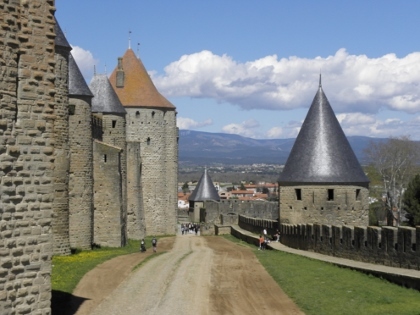 The main sight in Carcassonne is the double ring of walls which surrounds the entire city. There is not much to see within the walls: the Église Saint-Nazaire and the Château Comtal, both not outstanding. I was much more impressed by the massive gates, in particular the Porte Narbonnaise and the Porte d'Aude. The highlights in Carcassonne were our walk between the inner and outer wall, the views from the town (photo) and the Pont Vieux, and the illumination of the fortifications at night. We had diner in one of the restaurants in the old town and of course we have chosen the Cassoulet. It was good, but I think it was not the original recipe but adapted to the tourist taste. Anyway, we had a better one the next day in Toulouse. I visited this WHS in February 2014. The best views of this medieval fairy tale city are to be had while approaching the city from the tiny airport of Carcassonne, amidst the Languedoc vineyards. I spent 3 nights in the divine Hotel de la Cite inside the fortified city itself just opposite the peaceful gothic church. I'm glad I read the negative reviews of visiting in the summer months. I visited this enchanting city at leisure with few other tourists and most of the time I had the ramparts all to myself especially in the evening, when those who visit for a day trip vanish almost magically. The castle is best enjoyed from outdoors, especially on a sunny day. The views of the never-ending turrets from Pont Vieux or beneath Pont Neuf are definitely worthwhile. There are excellent parking facilities just outside the city walls and a couple of good restaurants where to have dinner inside the city itself. I've been wanting to visit this great WHS in France and my visit on Valentine's Day was another dream come true. This fortified citadel keeps you walking through its streets, the charm of the of the past remains until the present moment. It seems that the Middle Ages here are not over yetyet finished. Recommended sunrise or sunset with beautiful weather throwing the colors and the lights on the walls. Even at night it is fantastic. This site really looks genuine from medivial times. Incredible that they have been able to restore it looking so old and genuine. But the trick was of course to "abandon" the fortified town and build a new one below which could handle all the new needs state and people had. Fortified Carcassonne really gives the scene for medivial dreams. Of all the walled cities on the WHS list, this is my least favourite. The place seemed to have been turned into one huge outdoor restaurant. It was impossible to move through the streets without falling over someone's dining table. At least the traffic (apart from motor scooters and delivery vans) was kept out. Not a visitor-friendly place. I originally visited South France to see my best friend, who moved there when she was 8. It was her mum who suggested that we see Carcassonne. I wasnt expecting much but it was amazing! The amount of shops would make your eyes pop! Its built in an absolutely beautiful and hustoric landscape and I hope I can go and visit again soon. In our trip to France we have visited the stunning town of Carcassonne, that was a pre-Roman town, a Roman colony and then was conquered by Visigoths, Saracens, and Franks (under which was the capital of a county), under which became the capital of a county. It became prosperous in the period of the city-republics and then became part of the kingdom of France under the king Louis IX. The stunning fortifications, restored in the 19th century by Viollet-le-Duc, one of the founders of the modern science of conservation, that also added the roofs of the towers, consist in two lines of walls and in a castle, for a total length of more than 3 km. The internal walls are 1250 m long and have twenty-six round or horseshoe-shaped towers and follow the Late Roman walls (3rd - 4th century), made of ashlars and bricks, that are still visible on two thirds of the length of the walls and that were 3 m thick and 6-8 m high with 34-38 horseshoes-shaped low bastions at roughly regular intervals. They had rubble cores with courses of dressed ashlars intersected by courses of bricks and built on strong foundations; they are built on cubic bases surmounted by towers with windows on two storeys and semicircular external walls, the lower storey of which was filled with rubble to resist shock from battering rams. They were reinforced (11th - 13th century) in the medieval age by stones, merlons and windows. The external walls, 1650 m long and lower (7-8 m high) than the internal walls, have 19 round towers, that have many openings and are opened on their inner sides (so as to deny shelter to an enemy that might have seized them), three of which are barbicans and a fourth is a covered passage that linked the walls with the great barbican (where is now the church of St. Gimer, projected by Viollet-le-Duc), demolished in the 19th century. Outside (except on a corner, where are sufficient natural protections) there is a 4 m deep moat and there is a large space (the lists) between the two lines of walls. The walls were reconstructed in the final phase of building, in the late 13th century: two-thirds of them were rebuilt and modernized and four towers were enlarged, according to developments in military architecture. The main towers are: de la Vade, of St. Nazaire, that defend the cathedral, of the Bishop, that link the two lines of walls, the gate of the Aude, du Trésau and the gate Narbonnaise, that has a barbican and is imposing and very well equipped. The castle, butted up against the internal walls, has ten round towers in part with wooden roofs, a barbican, a dry moat, two courts, two living quarters with two squat towers, originally two-storeyed and surmounted by a crenellated parapet, and a defensive wall with three Roman bastions. The cathedral of St. Nazaire and Celse is a Romanesque masterpiece restored by Viollet-le-Duc, that added the two towers on the façade and the crenellated parapet, because he though that the church played a role in the defences of the town. It has a central six-bayed nave with an interrupted barrel vault and two narrow lateral naves with almost the same height and fully vaulted; the transverse arches spring alternatively from square columns surrounded by embedded columns and round pillars; the capitals have vegetal and geometric motifs. The Romanesque choir was replaced with a High Gothic structure, that is a transept with a six-sided apse; its exterior don’t have buttresses and the stability is assured by the interior vaulting. There are also chapels, sculptures, many tombs, relieves and stained glass. The roads and the squares have nice medieval houses; between them is also two wells, one of which is 40 m deep, and the remains of the church of St. Sernin. The town is one of the most beautiful and spectacular places I have ever seen especially because of the impresiveness of the fortifications. It's absolutely worth to be visited (if you go there you must leave the car outside the centre) also because it's the most impressive fortified town in the world and justifies the inscription. city. 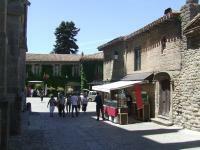 The shops in the city do not at all take away from the historical aspect of the city. person visiting France should truly make an effort to visit! Already a number of medieval walled cities. Also concern about 19C restoration by Viollet le Duc. 285 Community Members have visited.